Community resilience is a growing concern for cities around the world. 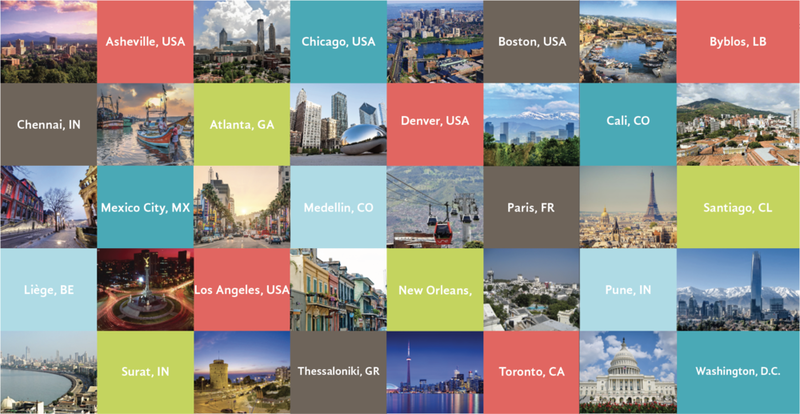 100 Resilient Cities, as pioneered by the Rockefeller Foundation, seeks to help cities around the world become more resilient to the physical, social and economic challenges that are a growing part of the 21st century. This view of resilience incorporates not just the acute shocks to a city—earthquakes, fires, floods, etc.—but also the chronic stresses that weaken the fabric of a city on a day to day or cyclical basis. Our team’s challenge was to explore resilience within the context of Savannah, GA through working with Emergent Savannah. Our first meeting with Emergent Savannah took place on Friday, March 31st from 3-4pm at Sulfur Studios in the Starland District of Savannah. The meeting began with team introductions and a powerpoint presentation by Emergent Savannah explaining their mission, vision, history and past/current activities that they’ve planned or are engaged in. During the presentation they discussed the effect of Ben Carter on downtown and how citizens were left behind in the decision to redevelop Broughton St. Their vision and opinions were not taken into account during the planning process which left many people feeling disenfranchised and shut out of their own community. Emergent Savannah does a lot of work in the community to bring together the ‘come here’s’, ‘from here’s’ and nobody hears. In other words, they try to connect people who have moved into the area, who have lived here their entire lives and who have systematically been ignored in an attempt to amplify their voices, and bring them together to work together. Citizens are at the heart of any society, and an active and informed citizenship is at the heart of any well-functioning democracy. Without informed and active citizens the resilience of open societies is compromised, and the health of those societies is at risk of faltering in the face of chronic or acute stresses. The United Nation’s Sustainable Development Goals (SDG’s) place a substantial focus on urban resilience in SDG Number 11: Make cities and human settlements inclusive, safe, resilient and sustainable. There is no shortage of examples to engage and empower citizens in democratic societies. Emergent Savannah is an organization dedicated to the activation of the public realm with open, vibrant and tolerant dialogue among and between citizens of Savannah. Our goal during this class is to work with Emergent Savannah in pursuit of a resilient society with active and informed citizens as both the driving force and the outcome of that resilience. Our design solution is focused on building resilience within the social fabric of the city of Savannah. Our team partnered with a local citizen group called Emergent Savannah and explore 4 different prototypes of projects that build person-to-person connection and empathy between residents. One of the projects prototyped was the Friend-O-Matic, which allows community members to get to know one another in a fun and very personal way. 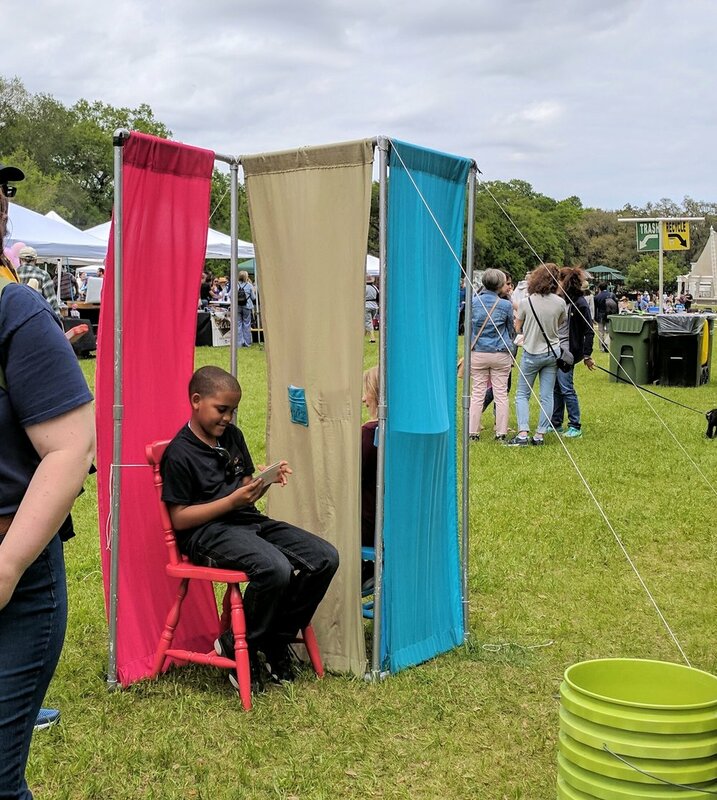 The Friend-o-matic is intended to provide an inviting and safe space for strangers to build connections around Savannah. Two chairs separated by a sheet of fabric act as the stage for random people to sit and have a conversation. We provided a range of personal questions for strangers to ask each other. By participating in the Friend-o-matic, citizens of Savannah can talk about themselves to build confidants around town in order to be more empathetic when more complicated issues arise. Two strangers sit down on the chairs on either side of the dividing panel. The design of the Friend-O-Matic mimics the idea of a confessional, or a safe space to be open and honest and to have a respectful conversation. They take turns asking each other questions from the cards provided. The question cards range is question difficulty from Mild, Medium and Difficult. The questions get very personal. As the strangers start asking each other questions, they start to become more than just strangers. During prototyping, we saw phone numbers being exchanged and tears being shed after these interactions took place. Sit down as strangers; leave as friends. For a comprehensive look at our process for developing the Friend-O-Matic and the other 3 prototypes we developed during this project, check out our team’s process book bellow.